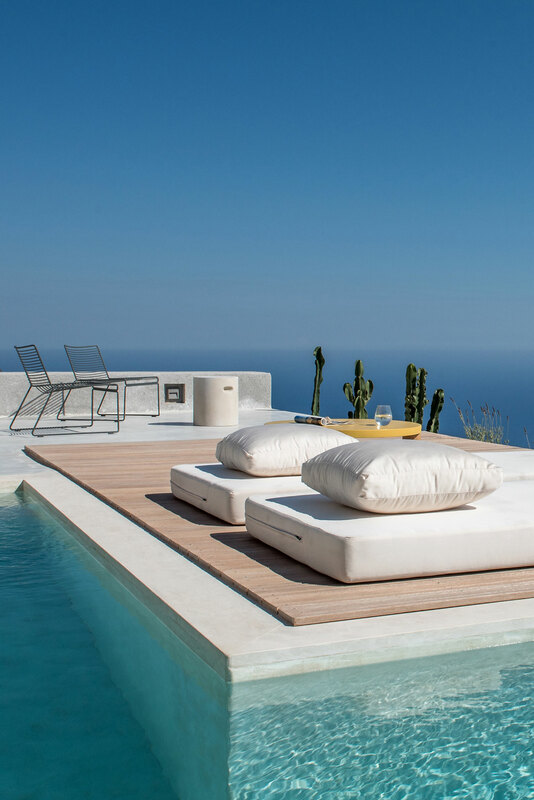 Perched high on a steep hillside of Profitis Ilias Mountain on the island of Santorini, worlds apart from the surging tourist crowds that flock to the island’s picturesque white-washed villages and volcanic beaches every summer, this graceful one-bedroom holiday house by local practice Kapsimalis Architects enjoys sweeping views of the Aegean courtesy of its favourable location and the architects’ astute design that gives occupants the impression that they are floating above the sea. 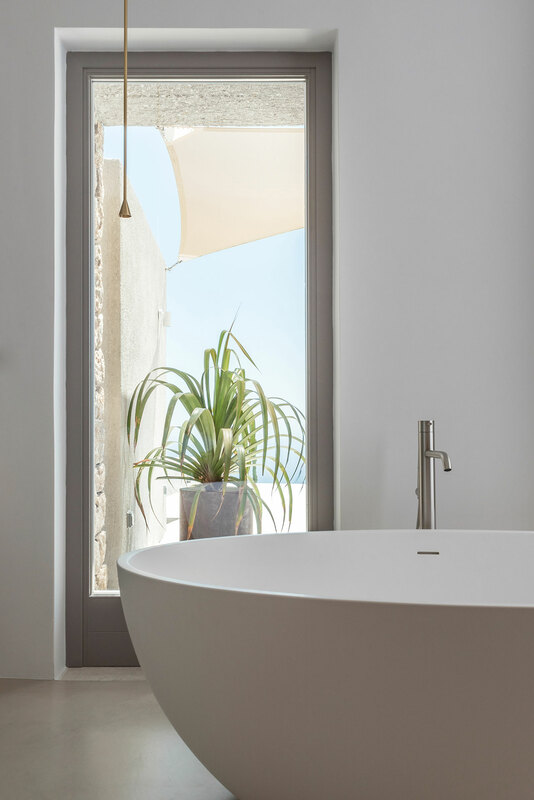 Taking advantage of the island’s traditional house-building techniques and sticking to a rigorous aesthetic of stripped down modernism, the architects have created a pristine retreat that is fully immersed into the soothing expanse of the Aegean blue. 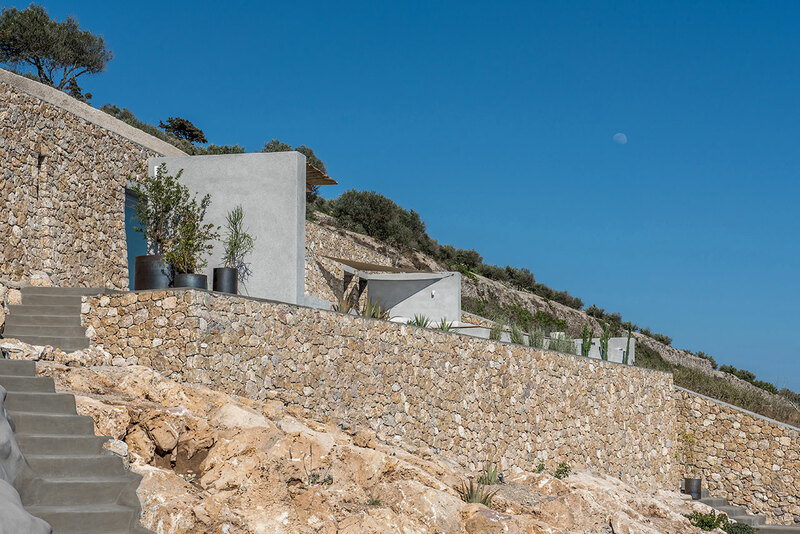 Taking a page from the island’s cave houses, locally called “yposkafa”, which are dug entirely into the volcanic rock without any foundations, the architects have nestled the house entirely into the mountain slope ensuring the least possible imprint on the landscape. 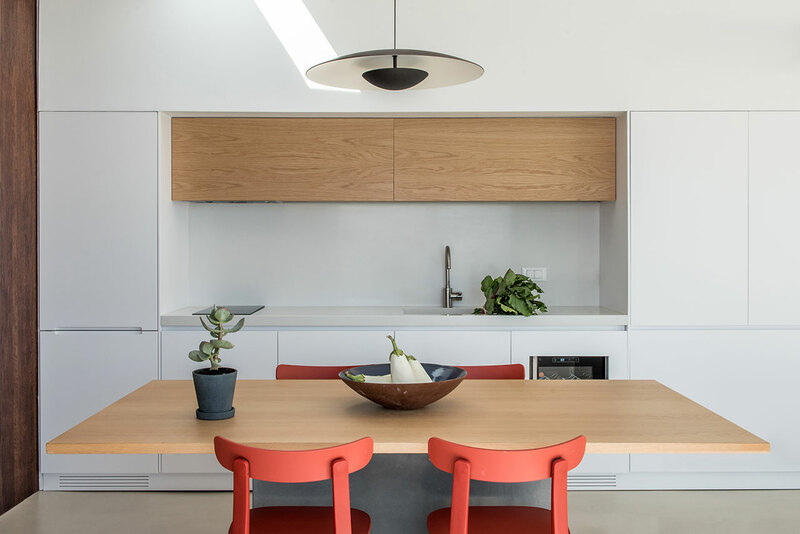 What’s more, the excavation material dug out during construction was put in good use building the house’s façade and the surrounding landscape, thereby further reducing any environmental impact. 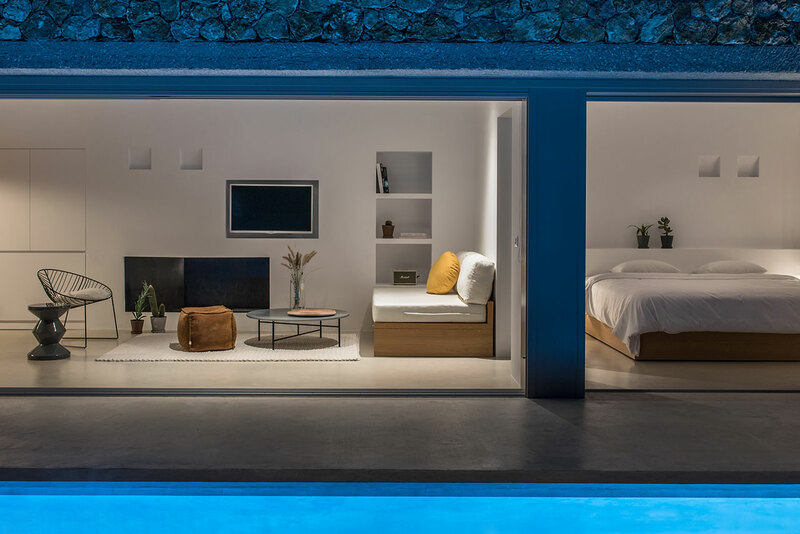 Whereas the typical cave house in Santorini is long and deep with a narrow façade, the architects have cleverly inverted these proportions, choosing instead to have a thin, elongated form with a 10-metre glazed façade that ensures that the living areas, an open-plan living and dining room and an adjoining bedroom, enjoy generous views of the sea. 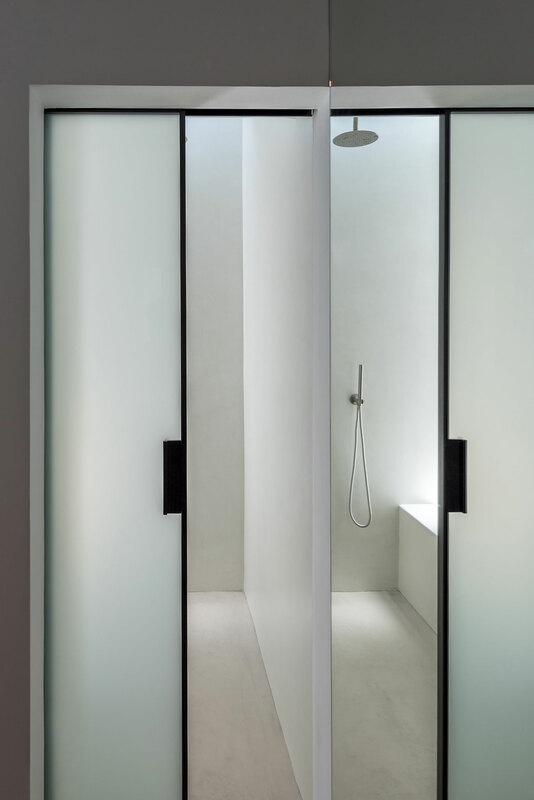 The use of sliding, floor-to-ceiling glass doors also makes it possible for the interior areas to seamlessly blend into the exterior terrace. 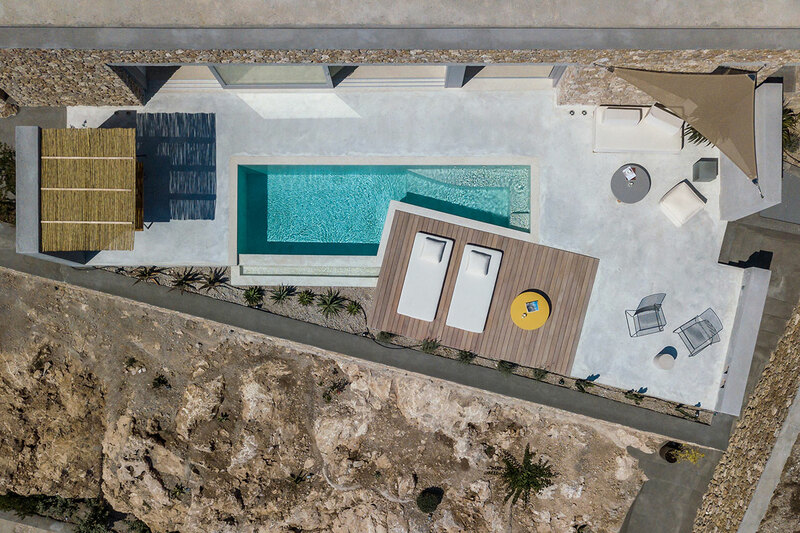 Free standing, concrete walls on either side of the terrace, which includes a sunbathing deck and an infinity pool, demarcate the two entrance staircases and support shading as well as funnel the views towards the sea. 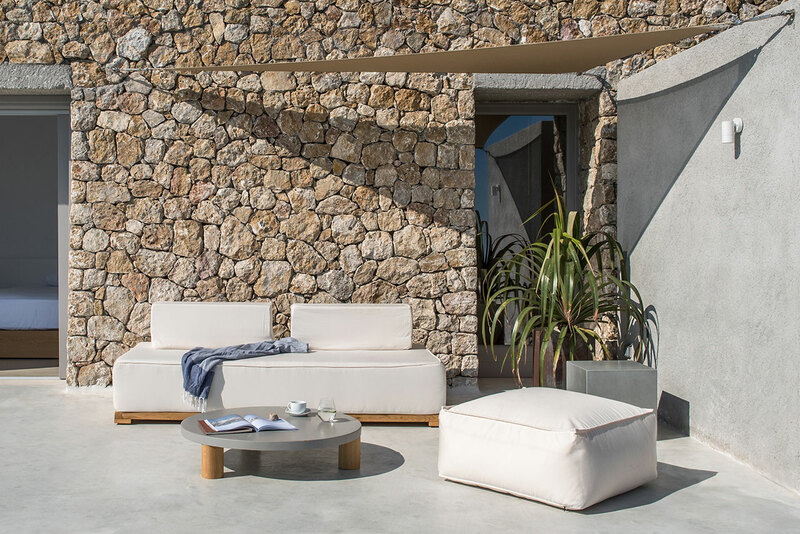 The prevalence of stones and concrete gives the terrace a clean-cut, stark aesthetic that both reflects and blends into the surrounding rugged landscape, while the selective use of timber and a selection of wild Mediterranean plants provide softer textures. 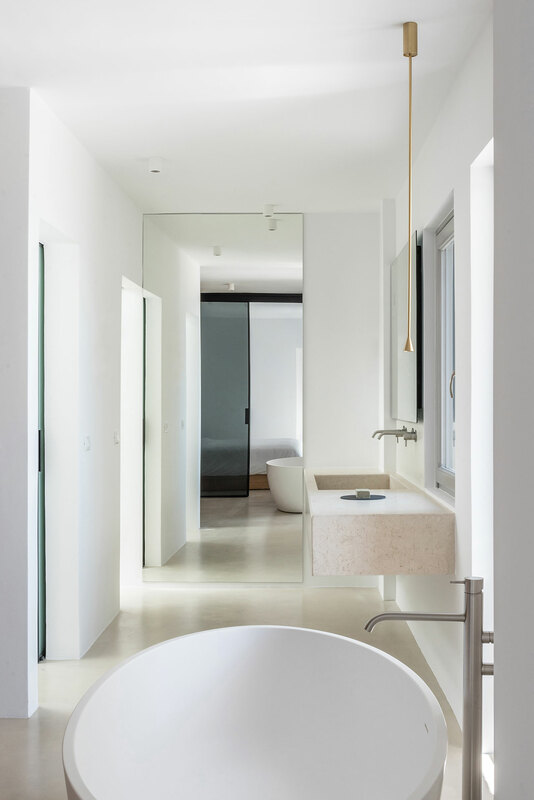 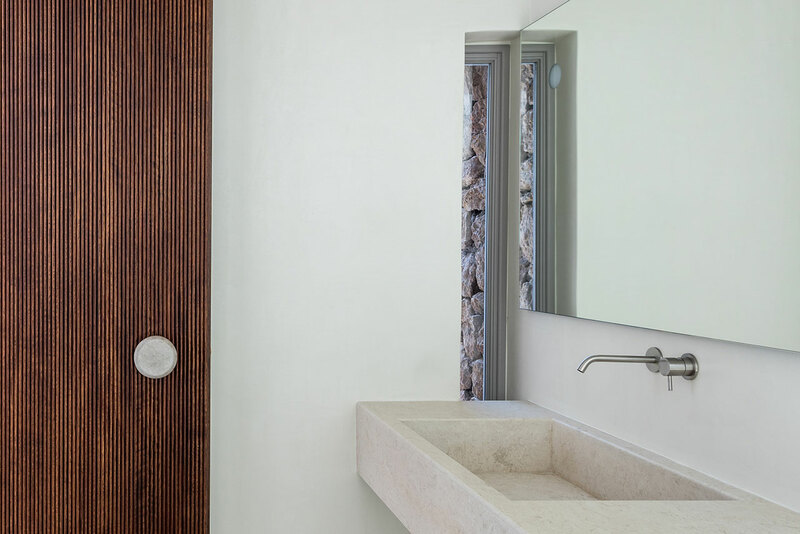 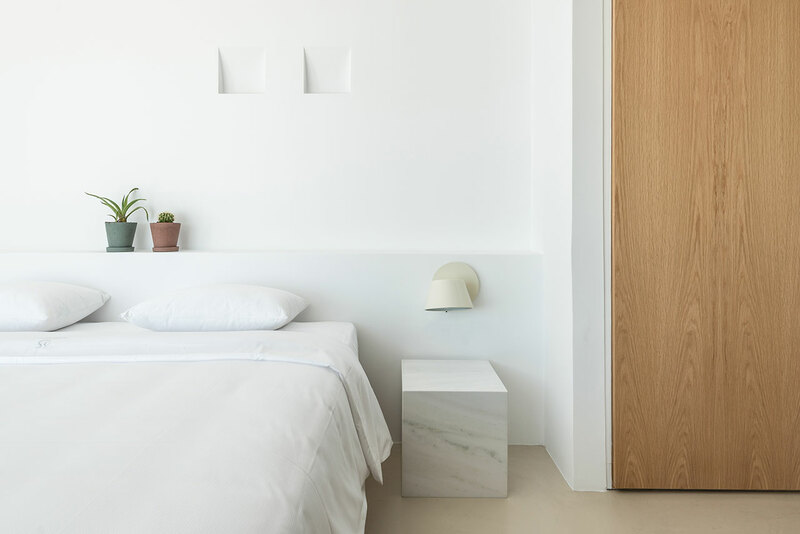 In the interior, the architects have gone for contemporary minimalism underpinned by a subdued palette of white, grey and beige that is complemented by the warmth of natural textures such as oak and walnut wood, and the starkness of black steel surfaces. 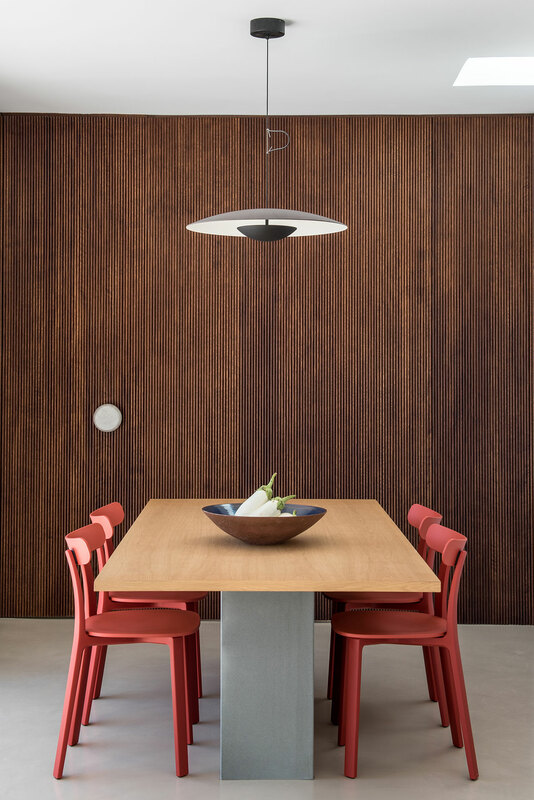 Meanwhile, an eclectic selection of furniture provides splashes of colour. 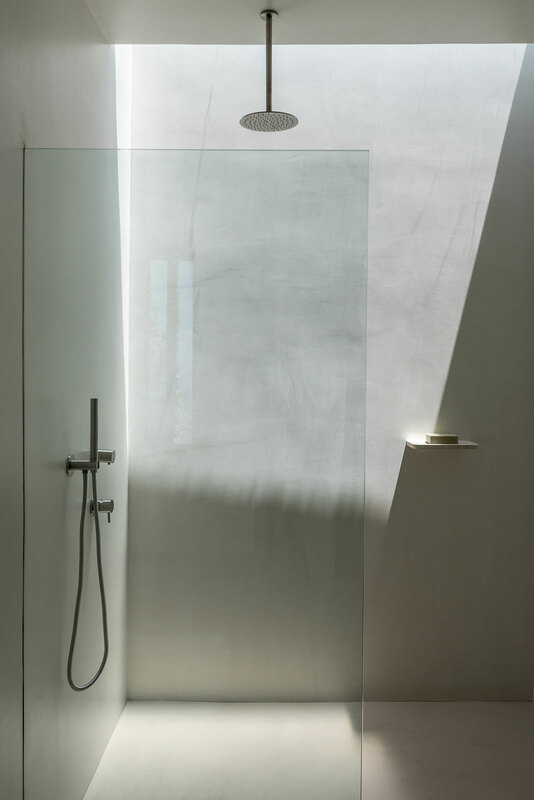 As expected, the living spaces are bathed in daylight thanks to the glazed façade while the two bathrooms, one on either side of the house, feature discrete skylights that create a more ambient atmosphere.